What is Involved in Specific Chiropractic Care? Our doctors are highly trained and experienced in assessing upper cervical biomechanical misalignments of the spine. If you’re a new patient, our goal is to establish a health baseline so we can measure progress once you become a regular patient. Do a routine interview with you to understand your current health status and medical history. Perform an examination of your spine and nervous system. This process of understanding your spinal balance and function is important when determining the best course of individualized care. Specific Chiropractic utilizes a neurodiagnostic procedure where we move a sensitive temperature scanning device along the sides of the spine. 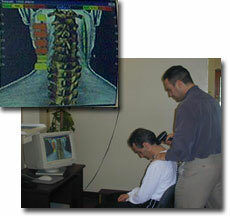 Irritation to the nervous system along the spine can be detected in the temperature differential scans. This is a regular procedure we perform before any adjustments are made. If you do require an adjustment, we will also perform this scan afterwards to determine if the correction made to the nervous system was successful. Questions? Feel free to contact us or visit our FAQ page! If during your examination we discover nervous system irritation in your spine, an accurate determination of the spinal vertebrae’s position must be made. 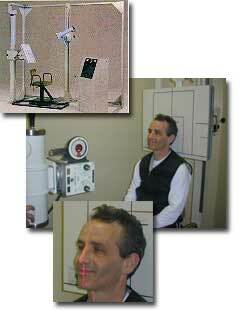 A high-precision laser-aligned x-ray instrument is used in our office for this purpose. 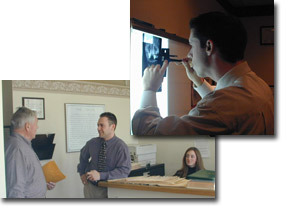 The x-ray images are then analyzed by the practitioner to determine the three-dimensional displacement of the vertebrae. Be assured that radiological examinations are performed only when clinically necessary to ensure proper patient care. The uniqueness of the bony anatomy of the upper neck dictates the use of a unique adjustment to correct a misalignment. We use specially designed tables which help relax the spine when adjustments are performed to the spine. For those patients unable to get into the required position due to their condition, other tables are available. A supportive recuperation period is important for two reasons after your adjustments. The first is to give the nervous system time to respond so that an accurate post-adjustment thermographic scan can be obtained. The second is to allow the ligaments and muscles holding the vertebrae to begin to stretch and adapt to the change in the bones’ position. Following a patients adjustments, the patient is escorted to a recuperation suite and remains there for approximately 20 minutes before the post-adjustment scan is taken. Helping the local Watertown, Newton, Waltham, Belmont and Boston area community heal naturally.